I took a bit of a break from my travelcation in Bamako a couple weeks ago to head out and explore a bit of the interior of the country. As you may know, Mali is currently a country divided by a conflict involving a faction of Al-Qaeda. Essentially, the conflict has divided the country in half. While most say that the south is relatively safe to travel, the kidnapping of a French-Portuguese man last week in the south-west near the border of Mauritania shows the delicate nature of safety in the region. In general, people have stated that the country is relatively safe, as long as one stays south of the city of Mopti. Thus, despite slight reservations about security, I headed north to both the towns of Segou (where I got last week’s photo of the week of the Niger River) and Djenne. While Segou is nowhere near the front line of Mopti, the ancient city of Djenne is only about 100 km away from the line drawn in the sand. I’m glad I made the trip, and have to say that I felt completely safe the entire time. I’ll have an article about my time in the city of Djenne in the next couple days. It really was a magical place of beautiful mud architecture, friendly people, and even a touch of magic. The photo below is a shot of the grande mosque in Djenne. It is the largest mud building in the world according to the locals, although I wonder if the people in Chan Chan, Peru have some contention with that claim? In any regard, the grande mosque is incredibly beautiful and reminds me of a giant sand castle. I didn’t know this place existed until I did a google search about 6 months ago and my reaction when seeing the search results was “why does no one know about this place?” It only took one look to want to visit it. 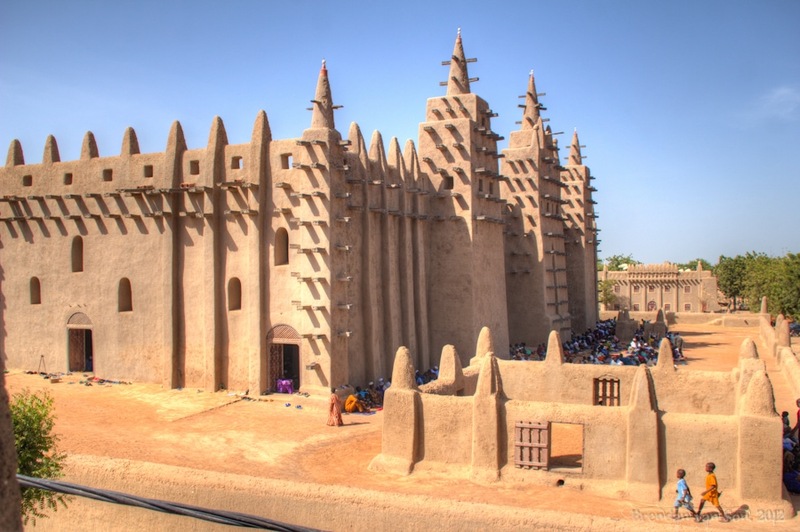 Now, after seeing this image below of the grande mosque of Djenne, do you want to see this place in person? Good photography is all about time and place. In terms of time, you want to be 1) shooting around sunrise or sunset when the light is a little less harsh or 2) shooting an important moment. If you can do both, you’ve hit the jackpot. I shot this image on a Friday during afternoon prayer at the grande mosque. All the people in Djenne dress up in fantastic outfits and head to the mosque to pray. It’s a phenomenal sight. In terms of place, what I mean is that you have to find a nice vantage point. If I shot from in front of the mosque I might pull some cool images, but it would be one dimensional. An image should tell a story, as dozens of people praying from the shade of the mosque does. Noticing the need to be higher to see into the courtyard of the grande mosque I paid a neighbour 200CFA for the right to climb onto their terrace to shoot photos. It was well worth it. I’ve read about this mosque before – and have wanted to visit. Nice photo, and some good info as well regarding on-the-ground conditions. Cheers Brendan. Who wouldn’t want to see this place in person! Breathe takingly stunning!! Wow, the kids walking really give it perspective in size! It really is massive… like a giant sand castle. I’ve heard of this & had same reaction… ‘Must go’! Can’t wait to head to Mali on 2013! Little Nervous about security though. Anisha, in Bamako it’s safe right now. Everywhere else is a little dependent on the north. Apparently Djenne, Segou, and Dogon are all possible at the moment. Anyways, when you get to Bamako be sure to check out the sleeping camel hostel… they’re the best in town for sure. Great picture. I remember seeing a blog post earlier this year about an event which happens once per year, when they “redecorate” the walls with mud. Cannot, for the life of me, remember who it was, but I remember a picture of his camera afterwards which was covered in mud! Yeah, after the rainy season they rebuild it. That’s why there are the sticks coming out of the mosque. They attach ladders to the sticks on the mosque and re-plaster it. It’s supposed to be a cool sight. Djenne really is incredible!